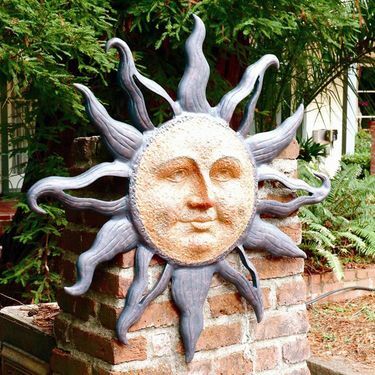 From our top of the line SPI Premium Garden Decor collection, we are thrilled to offer this exquisite new Rising Sun Wall Art Plaque! Inspired by the natural beauty that surrounds us, a talented team of 2-D and 3-D artists, sculptors, and craftsmen at SPI are dedicated to expressing that beauty in extraordinary sculptures like this one. The SPI Premium Garden Collection captures the charming antics of our animal friends with a touch of uplifting whimsy and charm. Our SPI Collection includes the most impressive home and garden decor pieces we've ever carried. We are certain you will agree and love your item! Size: 5"L x 37"W x 37"H., approx 13 lbs. Made of Aluminum. San Pacific International (SPI) has been creating extraordinary treasures for the home and garden since 1973. They are especially well known for their exquisite marine sculptures that include dolphins, mermaids, whales, fish and turtles. Valued by prominent interior designers and collectors throughout the world, SPI creations are what we consider Premium Decor, sure to please at even the highest levels. Through the years, SPI has earned a reputation for unique design and quality craftsmanship. Their artists and craftsmen spend months of work and hundreds of hours in development to bring you these exciting collections. GardenFun.com is very proud to be one of their largest and most loyal authorized dealers. Master sculptors breathe dimension to initial artwork and spend countless hours hand sculpting the modeling clay. Expert mold makers carefully break the sculpture into parts to create detailed champion molds. Each part is cast using either the lost wax or sand casting method. Artisans take the various cast parts and carefully weld them together. After several days of welding, sanding, and polishing, the metal sculpture takes its final form and the patina artists work to complete a true masterpiece. A talented team of patina artists uses various techniques to give the solid brass sculptures color and texture. The often imitated but never duplicated Art Finish is a hand-applied, cold patina technique that results in an illusion of light shimmering and reflecting off wildlife swimming in clear blue water. The Verdi & Bronze pieces are also produced using a cold patina process. The Classic Bronze Finish is oil rubbed by hand to produce a beautiful warm tone. For Imperial Finish pieces, patina artists use a combination of fine brushes and air brushes to apply up to twenty coats of vibrant color patinas meticulously by hand. Several layers of clear lacquer and/or a two-part urethane coating are applied to provide deep luster and superior protection. A final hand polishing gives the piece that extra shine. The largest Signature Series pieces undergo a hot patina process to give the piece vibrant, deep and complex museum-quality finishes not achievable by any other finishing methods. After patination, most of the sculptures are set atop a genuine granite or marble base. After a final inspection and polishing, the creation of this stunning SPI Gallery original is complete.